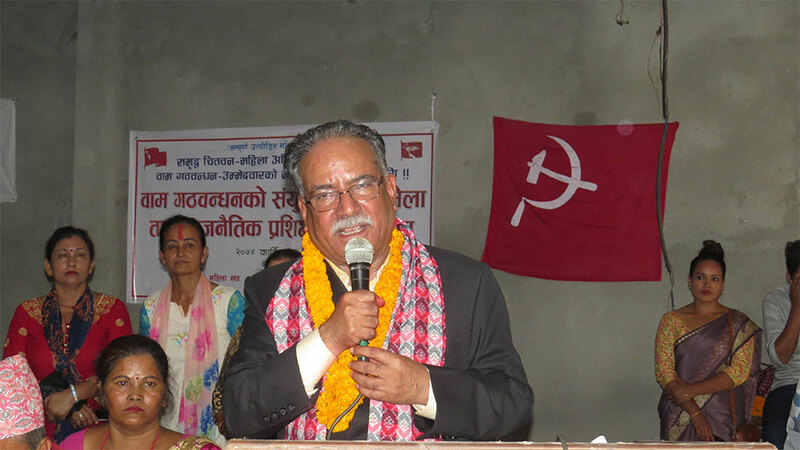 MAHOTTARI, Feb 18: CPN (Maoist Center) Chairman Pushpa Kamal Dahal has alerted his party cadres to act with caution and not become involved in any activity that may foil the unification of the CPN-UML and the CPN (Maoist Center). Addressing a mass gathering organized to welcome new party members in Mahottari on Saturday, Dahal cautioned his party workers against falling into trap set up by various domestic as well as external elements who want to derail the unification of the two parties. "In the last seven decades in the country's history, there never was political stability -- not a single government could complete a full five-year term. So, with the aim to ensure stability and push the country toward economic development, we, the two parties, formed the left alliance and now we have secured almost two-thirds majority. However, some internal, as well as external reactionary forces, are active to foil the unification and prolong instability in Nepal," he said. He said that after the left alliance swept parliamentary and provincial polls, there have been efforts from some quarters to break the alliance through force or other means. "So, I urge all party leaders and cadres to act with caution and not to get involved in any activity that may hinder the unification process," he warned. He also urged the party cadres to play a constructive role to make the unification a success. Over 600 members including some leaders of the Rastriya Janata Party Nepal formally joined the CPN (Maoist Center) on Saturday. Dahal welcomed them at the function. Central committee member of RJPN Anil Basnet among other leaders joined the CPN (Maoist Center).